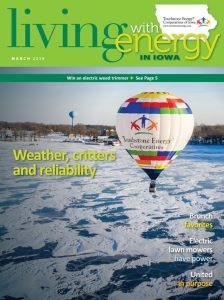 Featuring stories of Iowa’s electric cooperatives, Living with Energy in Iowa is a 16-page consumer magazine published by IAEC and distributed to more than 54,000 electric cooperative households every month. Living with Energy in Iowa shows how electric cooperatives contribute to the local economic growth and betterment of their communities and how they work to provide safe, reliable and affordable electricity that is environmentally sustainable. The magazine also offers tips on reducing energy bills, making energy-smart purchases and how to stay safe around electricity. And every issue features tried-and-true recipes contributed by co-op members across the state. Living with Energy in Iowa is an ad-free publication.